Freddy & The Biped 2016 T-shirt ~ Time is Running Out! 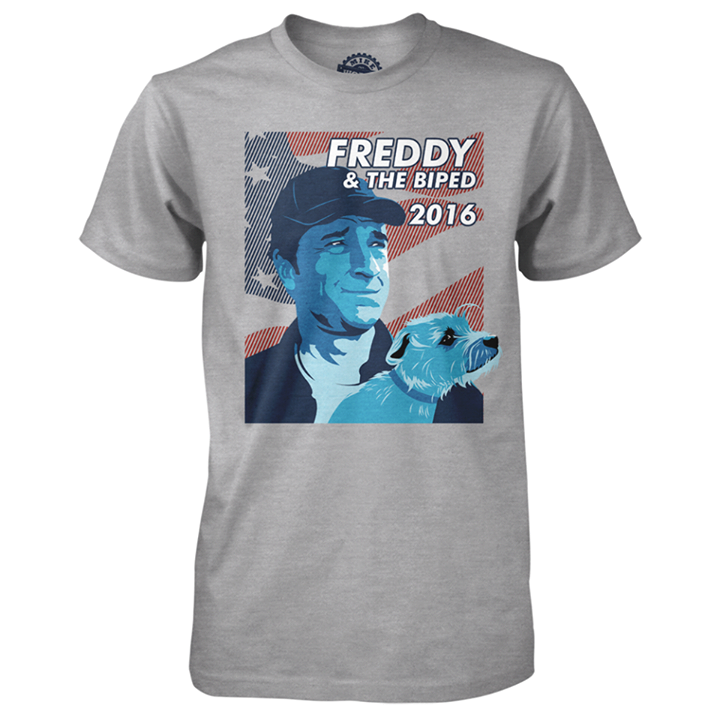 This is the last day you can purchase a “Freddy and the Biped 2016” T-shirt, so I’m not going to be clever about the reasons you should elect to do so. Here are the Top 5, in no particular order. 1. Each garment is made in the USA from natural fibers that probably wont chafe or make you itch uncontrollably. Unlike the candidates themselves, the quality is second to none. 2. The artwork is simple, elegant, and destined to resonate among those who understand the dog-eat-dog nature of politics. 3. Tonight at 12am Pacific Time, this design will be officially retired, and never again be reproduced. 4. A generous portion of the proceeds benefits the mikeroweWORKS Foundation. We’re raising money for the next round of Work Ethic Scholarships, and I’m eager to bolster the coffers once again. This really helps. 5. As a candidate, my dog is imbued with the precise temperament we need in Washington today. Freddy is not afraid to let the chips fall where they may. He’s fair but dispassionate. Loyal, but skeptical. He’s also happy to serve, but not so desperately that he’ll beg for your vote, curry favor, or slander his opposition for the privilege of doing your bidding. Most importantly, he can lick himself, so he’s mostly incorruptible. Get your timeless piece of campaign memorabilia today. Go to represent.com/mikerowe. Tomorrow, it’ll be too late. You’ll be on the outside looking in, wondering why you chose Cyber Monday to let the perfect Christmas gift slip through your paws.